The oral microbiome is a dense and diverse community of microbes covering every surface of the mouth. It is increasingly recognised as being inextricably linked to oral and systemic health. Dr Christina Adler will discuss the influence of ‘nature and nurture’ on the oral microbiome in health and disease. Dr Christina Adler is a medical scientist (BSc Hons, University Medal 2007, PhD Doctoral Research Medal 2012), and their research program focuses on understanding how the oral microbiome contributes to the maintenance of health and the development of oral diseases, particularly dental decay (caries) that is the most common chronic disease worldwide. Dr Adler’s research approach brings together diverse fields including evolution, genomics, microbiology and oral health, and they are in a unique position to span these diverse fields given their track record. In 2012, Dr Adler completed their PhD on the evolution of the oral microbiome and human population genetics at The University of Adelaide and was awarded a Doctoral Research Medal for producing one of the highest quality PhD theses. From this, she discovered that dietary changes during human evolution shifted the oral microbiome to a caries-promoting state (Adler et al., Nature Genetics, 2013). In 2012, Dr Adler has moved to The University of Sydney to take up a lectureship role. 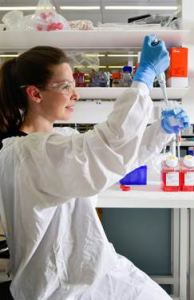 In this position, she has established an independent and nationally recognised research program investigating the role of ‘nature and nurture’ in the developing oral microbiome in childhood with the support of NHMRC project grants.